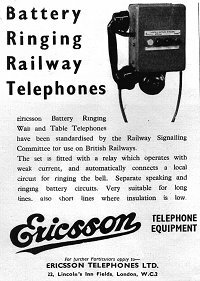 The telephones illustrated are examples of the specialised needs of the railway. 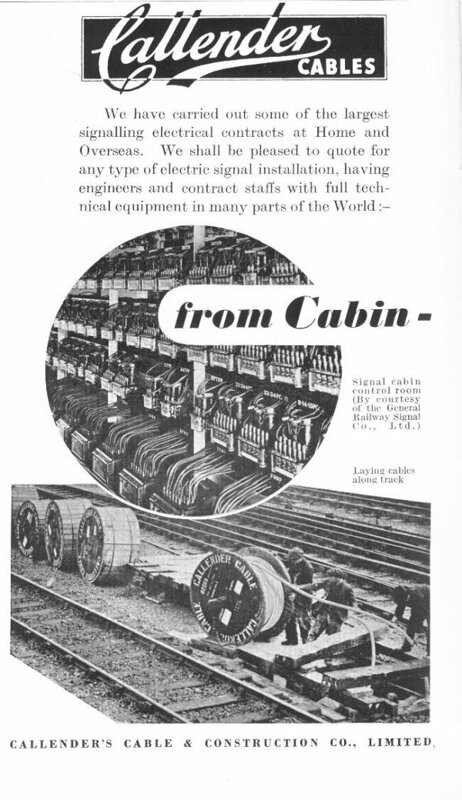 Cable pairs were always at a premium and so omnibus telephones were common. Coded battery ringing was applied using the different keys and each telephone was arranged to respond only to its own coded ring. Click on the images for a larger view and use the 'Back' button on your browser to return. Ericsson of Beeston, Nottingham, (not the present L.M. 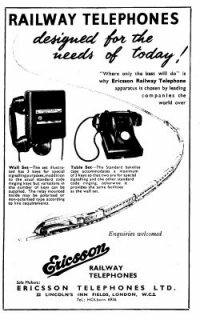 Ericsson of Sweden) were major suppliers of telephones to the Railway Industry. 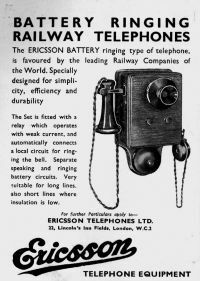 In their later incarnation as Plessey they produced what was probably the first truly weatherproof telephone, the model 745. Although it has been superseded by more modern electronic designs so many were installed that they can still be seen on the Railway trackside today. 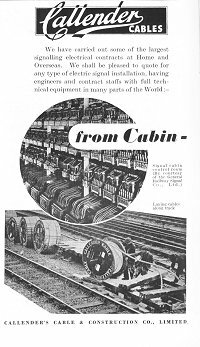 Thanks to Andy Emmerson for the first picture from the trade press in the 1950s, and to Roger Carvell for the others, from the British Railways Magazine, (unknown year) and 1954. A trendy streamlined loco hauling a rake of coaches winds its way round two of the phones from the range. The phone on the left can be seen in more detail below. The phone on the right is a standard 300-series telephone as used by the British Post Office, modified for local battery speech and coded battery calling. A rather older model here as evidenced by the Bell type receiver and the fixed microphone. A separate watch receiver is fitted on the right to assist hearing on faint circuits by supplying sound to both ears. This was a common feature on public network phones in France, but never gained much acceptance in the UK. Only two code buttons are supplied, probably applying battery to the line pair in forward and reverse dircetions. The bell is of the trembler type, consistent with DC operation, with the coils under the dome. A more detailed view of the phone on the left in the top picture. 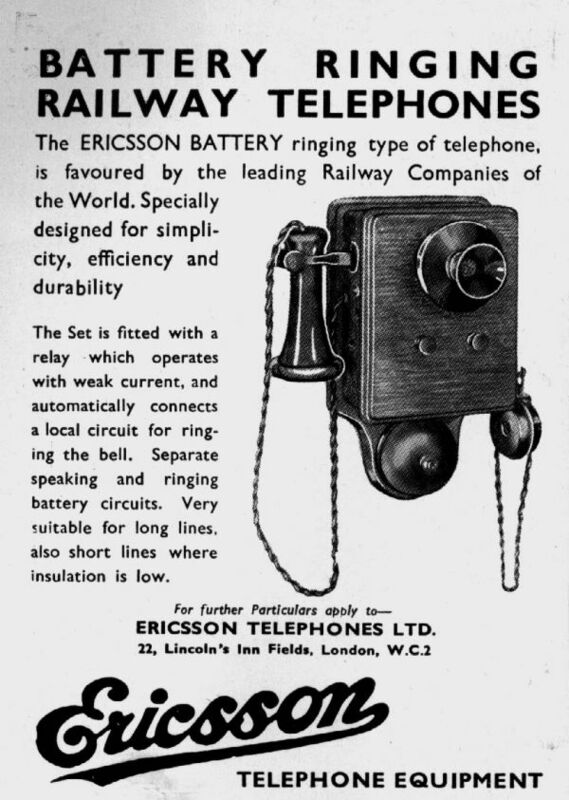 A more modern telephone than the one above shown by the standard BPO handset fitted. The bell design is the same. The legend above the ring buttons reads "Listen before ringing". The second button is labelled 'Special' and the end button 'Code'. 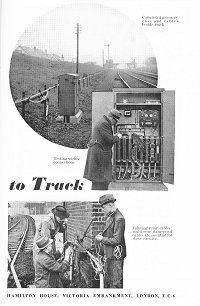 These ads are taken from the back of the book Railway Signalling and Communications by Tattersall et al, published by St Margaret's Technical Press, sometime in the 1930's to judge from the pictures. The Telephone Manufacturing Company of St Mary Cray, advertised this three-channel carrier system in the 1930s. 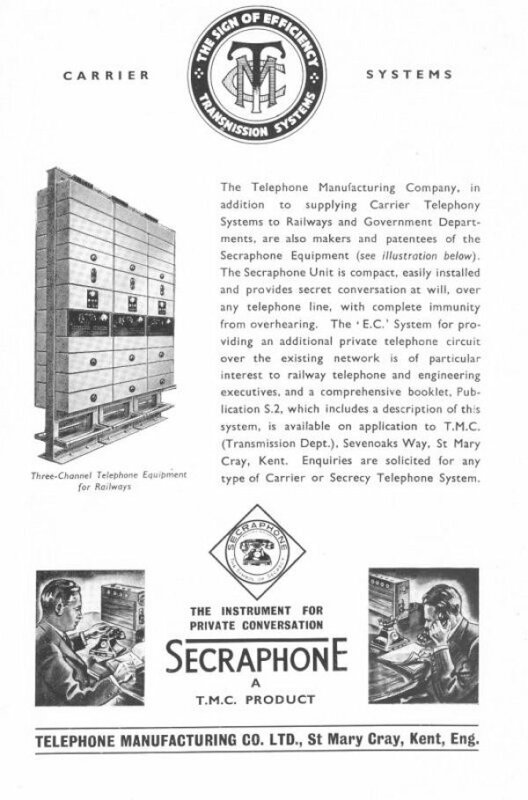 The other product featured is the Secraphone - an early encryption or scrambler system. No fork lift trucks for the men on the left. And on the right a classic image of signal and telecomms technicians working in their old suit jackets and wearing trilby hats. Not a high visibility vest in sight. 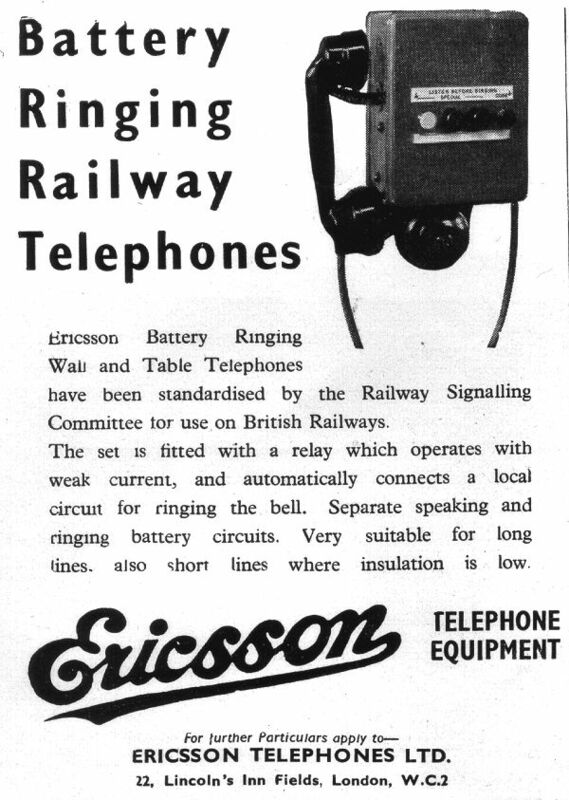 Next: Some of these phones in the flesh on the Kent & East Sussex Railway.